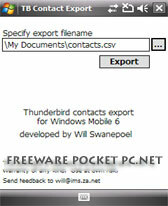 ContactManager v0.6 freeware for Windows Mobile Phone. 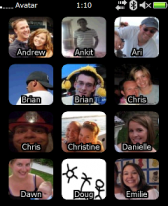 Summary: ContactManager v0.6 lets you play with your contact list with finger in iphone style. 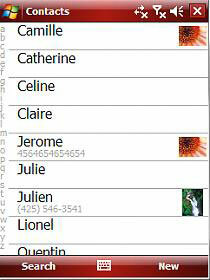 - tapping the contact make appear a screen with contact info (photo, name, phone, sms and mail). Selecting one option launch the default compose dialog or make the call. 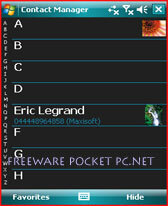 - display contact photo if present (in the list and the contact detail). - if you press you finger on the left or right border of the screen it will allow you to select the letter you're searching for, release the finger, it will show you the contact starting with this letter. For me that's the way to go in touch interface: release should trigger the event, push should only provide visual feedback, I'd like a visual kb like this. - the contact detail is not the standard one, for now it's quite ugly... if you're a graphist or have some idea about what's better... feel free. - the list is animated (scrolling) and the transition between list and detail also. There is an .ini file that you can create in the directory where the program reside. It contains color, font and image settings. See the setting.ini provided in the zip file. To install, copy the unzipped file to your ppc and run it. Should be enough. Tested on WM6 only, should run on WM5. This didn't work for me with WM5. Will this replace the original contacts application after installing? Or will be as a standard application? I tried SSContacts application(same as this) and that replaced the Standard Contacs Shortcut menu.